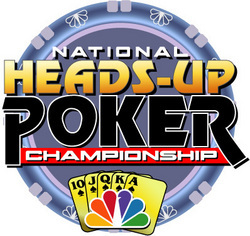 The first two weeks of NBC's exclusive coverage of the 2008 National Heads-Up Poker Championship have drawn higher overnight ratings than in any of the previous three seasons. Ratings show that coverage of the Round of 64, which aired on April 13 and on April 20, averaged a 1.45 rating and a 4 share, solidifying NBC's coverage of this event as the most watched of all poker-related televised programming. The ratings are especially noteworthy in that the first episode was aired in some major markets during the time that coverage of The Masters Golf Tournament was taking place on another network. This press release was written by Dennis Oehring, who serves as the Public Relations Coordinator for the firm POKER PROductions.